White Pelican Scheduled for Release on Saturday at Sepulveda Basin Wildlife Reserve — and You’re Invited! As we noted yesterday on our latest count of birds in care at our centers, International Bird Rescue’s Los Angeles wildlife care center currently has two American White Pelicans. One of these birds was found in distress with its leg and wing wrapped in fishing line, and was brought to us through remarkable teamwork by bird lovers in the San Fernando Valley. After several weeks at our center, this beautiful pelican is ready for release (and very ready to return to its pod) at the Sepulveda Basin Wildlife Reserve’s lake, where it was rescued. This bird is scheduled to be released on Saturday. If you’re in the area, please join us to celebrate! WHEN: Saturday, December 1 at 11 a.m.
WHERE: Sepulveda Basin Wildlife Lake. The address of the wildlife reserve is 5600 Woodley Ave., Van Nuys 91411. See map below for release location at the wildlife reserve. We extend our deepest thanks to the many bird lovers and organizations who helped bring this bird into care, including the San Fernando Valley Audubon Society, the Sepulveda Basin Wildlife Reserve, California Wildlife Center, the Los Angeles Specialized Mobile Animal Rescue Team (SMART), and wildlife photographer and naturalist James Hanlon. 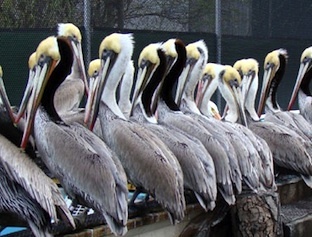 Pelicans are among the most costly birds to rehabilitate. Please consider supporting International Bird Rescue so that we can continue to care for these birds. Check out birdrescue.org/donate to find out how you can help. Common Murre release, video by Jeff Robinson, who volunteers at International Bird Rescue’s San Francisco Bay Area center. Grebes in Need — How You Can Help! Western Grebe photos by Isabel Luevano. International Bird Rescue’s wildlife care centers in Los Angeles and the San Francisco Bay Area have started to receive an influx of ill and injured grebes, such as these two Western Grebes above. As we detailed on our blog earlier this month, many grebes have been adversely affected by storms on the Pacific Coast. Some may have “crash-landed” and are injured or otherwise were unable to return to water. These birds, many transported from other wildlife rehabilitators to our centers, require extensive expert care, with frequent IVs and tubings upon intake. Staff and volunteers work extremely hard to get these birds back to health and waterproofing so that they may be kept in water during their recovery. We need your support to help return these remarkable birds back to the wild. How can you help? —Adopt-a-Grebe. Our honorary adoption program is a wonderful way to help a bird in need. And a $50 grebe adoption makes an excellent holiday gift for a bird lover in your life. It’s the ultimate in wildlife stocking stuffers! Learn more about the honorary adoption program here. —Volunteer. If you are already a trained volunteer for International Bird Rescue, please contact your volunteer coordinators and sign up for a shift. We appreciate the help during this busy time! Interested in becoming a volunteer? Find out more about our volunteer program here. 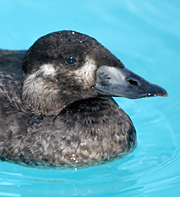 This Sooty Shearwater (Puffinus griseus) recently was found stranded and came into care at International Bird Rescue’s San Francisco Bay Area center emaciated and weak. It also has suffered from multiple foot problems. Staff veterinarian Dr. Rebecca Duerr surgically removed the tip of one toe due to an infected fracture. Post-surgery, the bird went directly back into its pool at the center to prevent further injury. He is being treated with antibiotics as well as salt: Shearwaters are tubenoses and require salt water or salt supplementation. Our staff reports that this shearwater is strong, feisty and on track for a full recovery! Sooty Shearwaters are also known for their migratory prowess, flying 40,000 miles a year according to one study. Read more on this species at National Geographic. Blue-Banded Pelicans R41 (top, photo by Rosemary Bishop) and R36 (bottom, photo by Mike Robinson). Since the launch of our Blue-Banded Pelican Sighting Contest, we’ve been receiving reports of banded pelicans every week. All of these sightings are important and interesting, but a few recent ones have stood out. R41 and R36 (shown above) are both first-year birds that came into our San Francisco Bay Area wildlife care center in July. R36 had fishing tackle injuries, and R41 was heavily contaminated with fish oil from one of the public fish-processing stations in Bodega Bay. Both were rehabilitated and released at Ft. Baker under the Golden Gate Bridge on August 23. These birds were just reported separately, but with other pelicans, in Victoria, British Columbia, about 900 miles north of the Bay Area. R36 was first seen on November 18, 87 days after its release, at Race Rocks Ecological Reserve in Victoria. R41 was seen on November 22, 91 days post-release, at Ogden Point in Victoria. R36 and R41 have traveled the farthest north of any banded pelicans that we have had sightings on thus far, and both were reported as healthy and normal-acting as seen in these photos. Not all of these rehabilitated birds survive. On October 29, T20, a first-year bird that had suffered fishing tackle injuries and was treated at our Los Angeles facility, was found dead near Las Bombas in Baja California, Mexico, 42 days after its release and nearly 600 miles from its release site in San Pedro near the Port of Los Angeles. Although the reporting of a dead banded bird is always unsettling, it’s nevertheless important information for this project. T20 recovered from its rehabilitation and clearly headed hundreds of miles south. It’s sometimes thought that young birds coming into our care with fishing tackle injuries are just pier bums, begging for fish scraps and getting into trouble. But that is not always the rule. Begging for free fish and stealing from fishermen is something that many pelicans, both young and adult, do because they’re opportunistic. T20, like many other young pelicans, was no exception to the rule and likely got hooked while trying to grab fish off a line that it thought was his for the taking. 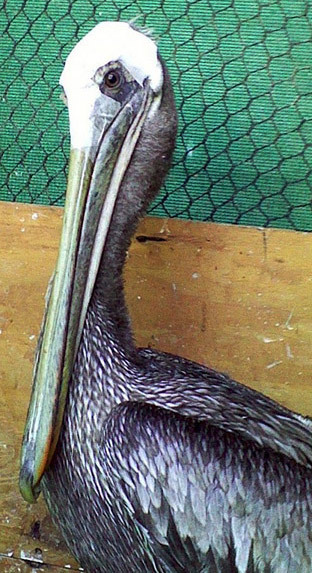 But it took off for Mexico, unlike many other rehabilitated young pelicans, and survived for 42 days before it was found dead on the beach. No obvious reasons were reported. As more banded pelicans are reported, we will share their stories. They are being discovered all along the coast, from Baja to British Columbia, piecing together a story of their survival along the way. Last week, we reported on this blog about a number of animals found on Alaska’s St. Lawrence Island contaminated by oil from an unknown origin. The source of this mystery oil has yet to be identified, according to news reports. But we’ve been at the ready to receive any oiled wildlife should more be found by officials or villagers on the remote island in the Bering Sea. After careful washing and treatment, the bird was released. We will keep you updated should we receive further oiled animals. Did you know? International Bird Rescue is no stranger to treating birds oiled by remote spills in the Alaska region. In early 1996, we treated 165 King Eiders (a large northern seaduck) that had been oiled following a collision of two ships. The accident resulted in heavy fuel oil leaking into waters near St. Paul Island in the Pribilof Islands, located about 750 miles southwest of Anchorage. A total of 126 birds were released by March 23, 1996. The survival rate at the completion of this response was 78%. Read a comprehensive report on this spill response here. International Bird Rescue’s Julie Skoglund releases a Thick-billed Murre found oiled off Alaska’s St. Lawrence Island and treated at the Alaska Wildlife Response Center in Anchorage. This adult Brown Pelican came to us with multiple fish hooks stuck in its jaw and wing. It made an amazing recovery. We are continually amazed by the sheer resilience of birds — animals often harmed by human causes, and therefore in need of human care. Record-setting numbers of birds needing care in 2012 has taxed our financial resources. Your generous donation helps keep our doors open to ALL birds. Every day of the year, International Bird Rescue receives and cares for injured and sick aquatic birds suffering from a host of problems. Now and then, we witness a miraculous story. A story of tenacity. A story of hope. And this kind of story doesn’t happen without you. But we are continually amazed by the sheer resilience of birds — animals often harmed by human causes, and therefore in need of human care. We see heavily oiled common murres come back to life with careful washing. Loons, ducks and petrels that crash into high-rises or lighthouses once again take flight after wing wraps and a little TLC. Even wayward albatrosses and tropicbirds find their course back into the deep ocean with our help. This pelican hadn’t given up. He was eating well, keeping his bill in alignment, even snapping aggressively at us like a normal, spirited pelican should! So Dr. Duerr and staff decided to give the bird a chance and strategized a plan to help him recover. It wasn’t easy: The pelican needed to use his mouth as normally as possible while healing, so bandaging and wound care were a challenge. But with careful treatment, the wound had reduced remarkably within weeks and could be closed with stitches. Until then, he had to be kept out of the water. Now he could finally go for a swim and join the other pelicans in our large pelican aviary. A wonderful sight. On November 1st, Dr. Duerr re-examined him. The injury was completely healed, and there was no evidence that the remaining muscles and bones of his jaw had further problems. The pelican had excellent range of motion of the joint and was snapping his beak at staff and volunteers with vigor. All medications were discontinued, and he continued to be fed and observed while gaining strength. What was it about this particular bird? He came to our hospital in horrible condition, as so many others do, from a cause that wasn’t inflicted upon him by nature, but by humanity. Something in this bird offered hope. Matched in tenacity by the staff that cared for him, this pelican beat the odds and not only survived, but thrived. Over 900 pelicans were admitted to our hospitals this year, a record for us. Pelicans and other aquatic birds are important to all of us because they are critical indicators of ocean health. And every day, we see how they’re affected by environmental problems when they’re brought to our hospitals by people like you, people who care about what happens to them. Helping them now ensures the conservation and protection of these species for generations to come. Each dollar you give is critical. Your support provides dinner-bowls of fish, essential antibiotics, water to fill our hospital pools, bandages, x-rays and expert care to every bird that comes through our doors. Record-setting numbers of birds needing care this year taxed our financial resources. Our commitment to “never close our doors to any aquatic bird in need” is in jeopardy. In order to continue to provide expert care, an open door policy and hope for these birds we are asking you to donate generously today. Your investment in Bird Rescue ensures that this level of expert care is always available in any emergency. We cannot do it without you. Please become a member today. Annual membership provides us with the ongoing financial security to operate our programs. Give a gift of membership to someone you love. P.S. – There are many ways you can help the birds at International Bird Rescue. Please consider adopting a pelican or one of our other seabirds that needs your help. As always, your gifts are tax-deductible. In last week’s clue for our current Blue-Banded Pelican Sighting Contest, we talked about pelicans commonly found on the breakwaters. This week’s sighting tip? Pelicans love to hang out on sandbars with fellow pelicans, gulls and other birds. They like to bathe in fresh water around these areas, so often you can see them preening and lounging after bathing. It’s an easy place to spot them, and there’s usually a limited amount of grass or rocks to block the view of the bands. So check out sandbars in bays or at the mouths of rivers. During domoic acid outbreaks in the Malibu area, we go to sandbars to identify pelicans that are being impacted. Produced by harmful algal blooms, domoic acid is a neurotoxin, and birds that have been affected can be seen weaving their heads back and forth. Pelicans that have been heavily impacted can even fall out of the sky. If we can get to them in time, we can treat them with aggressive fluid therapy and medications to reduce the seizures. Many survive. J65, as seen here in the photo above, came to us as a sick adult bird, having hung out around the Malibu spit. Unfortunately, this bird did no survive post-release. A post-mortem did not show any abnormalities — it may simply have been an old bird. Whether or not they survive, we collect as much data as we can on these Blue-Banded Pelicans to find out more about their post-release experiences. Want to know more about this sighting contest? Check out the rules here. You can report your sighting via our online system. It costs about $110 a day to provide the fish needed to feed these birds. Will you help us FILL THE BILL? Donate and support these animals in need today! Pelican watercolor by David Scheirer, Studio Tuesday. Western Grebe photo (center) by Bill Steinkamp. An oiled Scoter from the 2007 Cosco Busan Oil Spill. Photo courtesy Glen Tepke. As I passed by the Emeryville shoreline today, seeing small rafts of sea ducks floating in the San Francisco Bay and shorebirds foraging at the low tide line made me choke up with emotion. After all, it was five years ago this month that I watched helplessly as globs of oil from the damaged MV Cosco Busan tanker washed ashore at the height of seabird migration, fouling the entire Emeryville-Berkeley waterfront and coating tens of thousands of wintering birds in a thick, brown goo. After flying thousands of miles from their summer homes in Canada and Alaska, they landed hungry and tired, only to meet their deaths by drowning in gummy, sticky bunker fuel. I saw an oil-covered cormorant frantically trying to preen itself on a pier. At the tideline, I watched as many oiled mallards sat cold, wet and helpless. The surf scoters I adored, the beautiful black-and-white buffleheads, the delightful scaups and coots — few of these birds could escape the onslaught of the 53,000-gallon oil slick spreading relentlessly throughout the Bay and into the Pacific. We rescue sick, injured and oiled birds 365 days a year at two California wildlife centers. Your support makes it possible! When I saw the natural places I loved being destroyed before my very eyes, along with the seabirds I learned to identify over years of observation, it made my blood boil. I remember calling everyone I could think of: the Coast Guard, the Berkeley harbormaster, my local representatives, all to find out what could be done to stop the tide of bunker fuel from surging onto shore. It was through this horrifying and frustrating experience that I discovered International Bird Rescue (IBR). Almost immediately, the organization’s truck was on the scene, equipped with towels and carriers waiting to ferry affected birds to IBR’s San Francisco Bay Area rehabilitation center in nearby Fairfield. Volunteers brought much-needed supplies as the skilled staff scurried about the shoreline in white Hazmat suits using giant nets to capture the most seriously oiled birds. What struck me then — and continues to inspire me now — is that International Bird Rescue is an expert in both rescuing and rehabilitating oiled birds. Once the birds were at the center, they were carefully assessed, rehydrated, fed and washed. IBR’s team meticulously monitored the recovering birds as they were later transferred into blue, cold-water pools along with their fellow patients. Hundreds of wonderful aquatic birds, from murres to scoters and grebes, were successfully treated and released. I’m grateful everyday for the mere presence of International Bird Rescue. No matter where in the world oil spills or other environmental emergencies occur, from New Zealand to the Yellowstone River to the Gulf of Mexico, our expert team is experienced and well-equipped to save wildlife from any disaster. And here at home in California, we have a crack team ready to go that gives 5,000 birds a year their wings after injuries and other events incapacitate them. I want to thank you for helping make us the most skilled bird rescue and response team in the world. P.S. – If you feel as strongly as I do about these beautiful seabirds, please give as generously as you can this year. Increasingly, we are asked to take victims of all kinds of emergencies beyond oil spills — toxic algae bloom events, “mystery” oil seeps, and other aquatic mishaps that are, sadly, becoming more common each year. For this work, we rely solely on your help. So, for all of you who love the beauty and mystery of seabirds and shorebirds, we ask you to contribute. I thank you for your kind support. All photos © 2012 Jim Hanlon. Jim Hanlon, a wildlife photographer and naturalist, writes this guest post on an American White Pelican rescue. This large and beautiful aquatic bird had gotten tied-up in fishing line at the Sepulveda Basin Wildlife Lake, and through some very creative and persistent community teamwork, the bird was successfully captured two days after the first sighting. The White Pelican was treated for injuries at International Bird Rescue’s Los Angeles wildlife care center in San Pedro and was released on December 1, 2012 at 11 a.m. Jim Hanlon’s work can be viewed online at hanlon.smugmug.com. Indian summer-like conditions were swirling in Southern California on October 24, 2012 at 10:07 p.m. in the evening when I and others in the Sepulveda Basin birding community received an email from Muriel Kotin of the San Fernando Valley Audubon Society (SFVAS) indicating that a White Pelican was in distress at the Sepulveda Basin Wildlife Lake. The bird’s leg and wing were tied-up by fishing line tied to a plastic bottle, a common fishing pole substitute used by illegal fishermen at the lake. Passion stirred within, and several other birders and I were out there the following morning to search for the bird. Two Turkey Vultures were first sighted on the small island at the center of the lake foraging on the ground, and immediately I thought, This can’t be good. Then moments later while hustling to Station 3 at the lake, I came across a middle school field instructor with 15-plus students taking a bird walk. The instructor had seen the pelican between the cove and Station 2 and indicated that the bird was having trouble flying. The overall situation didn’t look good. So I continued to Station 3, which is the only way to look back at the cove, situated just south of Station 2 (the point), and there nestled behind some reed with a bottle in tow was our tied-up and distressed “Firebird,” a beautiful American White Pelican (Pelecanus erythrorhynchos). I quickly telephoned the L.A. City’s Animal Rescue Service, and shortly thereafter they sent out agents Glen Julian, Armando Navarrete and Ernesto Poblano. Glen suited up in a dry suit and entered the lake on a boogie board. However, fins were accidentally forgotten, which made the board more energy consuming and difficult to maneuver. Glen managed to coax the large pelican into the cove, and then the bird started moving up toward me where I was positioned at Station 3. I happen to know this pelican and his relatively large (80-plus) colony very well, and it was almost like he was coming toward me looking for my help. I softly flashed a white net to keep the pelican from going further south away from Glen, and that worked to some degree. However, just as Glen started to reach for his net located at the small of his back, the stealthy big bird scooted right by him to the north, and that was it in a flash. The chance to have captured the bird right there at lake’s edge was missed, and by such a close moment involving a realistic split second of pause. In frustration, I then backed away in heavy disappointment, regained composure and quietly became more determined than ever to see this pelican rescue through. It was now approximately 4 p.m., and the SMART team decided that everyone should reconvene the following morning for a second attempt. Annette Ramirez of the SMART team attempts to rescue the White Pelican. Armando from SMART and I arrived at the lake the following morning with two other birders, and none of us could spot the injured pelican after an hour-and-a-half walk around the entire lake. I was now standing with several Audubon members at the point (Station 2) feeling very disappointed and agitated knowing that the rescue team, which was also searching the lake, would leave soon if we didn’t spot the pelican. However, I absolutely was not willing to give up — a classic rule for most worthy achievements. There was just too much energy and compassion building up for this bird at this point, and time was of the essence. So as I had done with the rest of the lake previously, I raised my binoculars and intensely examined the reed at the bank in the final unexplored section across from the point, and sure enough there he was, hidden deep within the reed with slight glimmers of white coming through. What a sight! A mere 10 minutes later, one of the foraging pelican pods of 15-plus glided right by our distressed bird in hiding. And then our injured pelican decided to come out with the bottle in tow. The bird wandered the whole lake for the next two hours, and as soon as the complete rescue team arrived, Firebird had nestled himself up on land, at lake’s edge, in the cove, at the perfect spot for capture. Interestingly, I was actually asking the large bird calmly and quietly (maybe more telepathically than literally or a little of both) to go to that area the whole time. After all, Firebird had spent several hours there on the previous day, and I was now clearly and emotionally connected to this very large bird in need of our help. It was now time for L.A. City’s one and only SMART team to gear up and go into action. And that is precisely what they did. It was a fairly quick, clean and well-executed capture. Annette Ramirez of SMART, a hero with compassion, paddled out in a just-purchased inflatable kayak and blocked the bird at his perch. The netters then quickly swooped in. At this point I had lost my angle of view, and approximately two minutes later I saw Ernesto Poblano of SMART carrying the pelican ever so nicely, with the beak properly open a little for breathing and the soft towel perfectly covering the eyes while containing the large bird. Ernesto laid Firebird down and the team went to work on removing the fishing line and checking the wings over. The team noted one small tear on the lining, at the edge, on the elbow of one wing along with a slight cut on the upper leg, so additional care was deemed necessary. Congratulations and big hugs of gratitude go out to all of the fine members of the SMART rescue team for persevering, improvising and bringing a potentially difficult capture to a smooth and successful conclusion. Armando, while waiting for the balance of the team to arrive, resourcefully made a quick run to Big 5 to purchase the kayak out-of-pocket, and I gladly later reimbursed him for this. Well amongst all the excitement of the rescue and concern for the condition of the bird, however, there was one very special and subtle moment of pure compassion that lit my heart. It was so good I had to step back from the scene for a moment, look at the edge of the lake, and if there was ever a time to feel grateful, this was definitely one of them. For immediately after Annette Ramirez finished her last check of the wing, she then softly petted the animal’s wings twice with such caring affection, a clear communication to the distressed bird that we were there to help him. And this was Annette’s final move before transferring the White Pelican back to the truck for transport. Annette is a tremendous asset to the rescue team. The pelican was immediately taken to the East Valley Animal Shelter, and then later that afternoon transferred to the California Wildlife Center in the Malibu mountain area. Being a large aquatic bird, one of the largest with up to 9-foot wing spans, the pelican was then transferred several days later to the Olympic stadium of aquatic bird recovery centers, i.e. the International Bird Rescue (IBR) facilities in San Pedro. Chapter 2 now for the rescued White Pelican was medical attention and rehabilitation at IBR’s 40-foot-long and 100-foot-long cool water aviary pools along with 20 other Brown Pelicans also currently under IBR’s intensive and extensive care. A recent conversation with Dave Weeshoff, an experienced and dedicated IBR volunteer and President of the San Fernando Valley Audubon Society, showed me the vast amount of IBR expertise, care, effort and time that goes into bringing distressed birds back to a condition of strong health in order for the birds to have the best chance for survival once released back into the wild. Release criteria includes good blood values, weight, temperature, ability to fly between perches, demeanor (I know Firebird will pass this one) and appetite. The pelican eats 3-4 pounds of fish per day. White Pelicans tend to prefer freshwater fish, making the $1 per pound sardines at the center not very tasty. Dave says the White Pelican prefers the more expensive night smelt at $2 per pound, and when I offered to bring over some tilapia, Dave elaborated even more on the benefits of not feeding them oily fish, which can drop in the water and create other problems. On the medical front was the healing of a silver-dollar sized wound at the edge, on the lining, at the elbow of one wing. For this, IBR technicians use a technique known as debriding, where the scab of the wounded area was removed every two days or so. Evidently, these birds heal from within and debriding helps. There was also a slight constriction wound around one leg. The bird’s main 14-inch flight feathers were in good condition, and the overall prognosis for eventual release was good. On November 12, Firebird was working out and feeding in the 40-foot aviary pool at IBR. This wonderful bird and I are as grateful as ever for everyone’s contributions in the rescue including Audubon members, the SMART rescue team and IBR’s incredibly talented and devoted staff. On November 16, I was able to visit our White Pelican and tour the IBR facilities, and what I saw there was nothing short of incredible. International Bird Rescue rehabilitation technician Kylie Clatterbuck with the White Pelican in the large pelican aviary. And words could never explain just how important (and cool) this place is. Efficient state-of-the-art facilities, people and procedures all geared toward helping injured aquatic birds including pelicans, cormorants, grebes, seagulls and others. The facilities were primarily established to help large numbers of distressed birds in case of an oil spill; however, IBR helps birds all year around for a variety of conditions. Interestingly, I was standing 100 feet away from the aviary talking quietly with Dave for a few minutes before entering the aviary to see our pelican for the first time. And while we were talking, I glanced over at the aviary, and there was Firebird poking his head up and looking right at me. All the other Pelicans were busy doing something else, but this one wouldn’t take his eyes off me. Perhaps I’m a member of his Pelican pod now. But Dave reeled me back in, and explained that they don’t like the birds to get too comfortable with human interactions, as it’s important that they remain wild, which I clearly can appreciate. This pelican was released back at the Sepulveda Basin Wildlife Lake on Saturday, December 1 at 11 a.m. However, the story is far from over. In the spirit of author Paulo Coelho, I would like to suggest that like all great birds written about in prior myths before him, our rescued American White Pelican (“Firebird”) will strike his own chord by soaring to great heights in the sky just before sunset. And on that day and on each and every anniversary of that day for eternity, whether via himself or his eldest of kin, this great bird will release magical gifts of gratitude for one full hour to all those willing to watch and listen for his blessings. This Sharp-shinned Hawk, the smallest of hawk species in North America, came to us from Pasadena Humane Society contaminated with glue trap material on its flight feathers and ventral side of the body, according to Marianne Dominguez, a rehabilitation technician at our Los Angeles care center. All photos by Dave Weeshoff. A Western Grebe at our Los Angeles center, November 2012. Photo by Bill Steinkamp. With fall migration in full swing, large numbers of migratory birds are moving through California on their way south. These birds follow the Pacific Flyway, one of four major routes in the Americas for migratory travel that range from the Arctic to Patagonia. As rehabilitators of migratory aquatic birds, autumn becomes a very busy time for International Bird Rescue. Migratory birds come to our centers for many reasons, but most commonly are victims of either “crash landing” or “failure to thrive,” the latter a phenomenon that impacts many young birds. Crash-landed birds, also known as grounded birds, are birds that have hit the ground and are unable to regain flight. Grebes, loons, some species of ducks and other seabirds are the most common birds we see with this problem. For example, by our last count we more than 30 grebes — Western Grebes, Eared Grebes and Pied-billed Grebes — in our care, many with signs of crash landing. Why do these birds crash land? Birds can easily mistake wet pavement and shallow ponds as deeper waterways and can become grounded in parking lots and streets. Grebes, for instance, are excellent swimmers, with their feet placed far back on their bodies, but they are not suited for land and require a long water “runway” to take flight. When grounded, these birds will end up dragging themselves as they try to swim. Unless captured, treated for their injuries and moved to water, they will die. Storms and strong winds can also contribute to grounding, as gusts can knock a flying bird to the ground (we commonly receive many grounded birds after storms). Nationally, one of the worst single cases in recent years occurred last December in Southern Utah, where thousands of Eared Grebes slammed into a Wal-Mart parking lot. Wildlife officials and volunteers saved about 3,000 of these birds, according to news reports, but about 1,500 died (see video below for releases). At our two wildlife care centers in California, we receive many types of grebes that crash-land and injure their sensitive feet. They also sometimes require treatment for deep wounds and abrasions, as well as fractured wings, legs and keels (the extension of the breastbone) when these birds hit the ground hard. Grebes are remarkable birds — some are capable of breathtaking courtship displays — so seeing them in this predicament is about as heartbreaking as it sounds. What is failure to thrive? Failure to thrive is a term we use for a bird that is simply not surviving for non-obvious reasons. Grebes, for example, are predators that must learn to fish, and young birds are prone to starvation if they cannot find food in a challenging environment. These are typically first-year birds and come to us weak, emaciated and often with high parasite loads. Sometimes they are found grounded, though usually these birds have washed up on beaches. Unlike young pelicans, which we typically receive during the summer months, we see many young grebes in the fall as they attempt their first migration southward. How do we care for these birds? 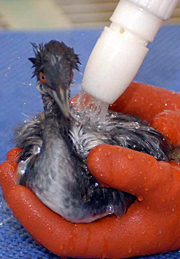 Thin and weak grebes are given immediate supportive care at our centers. This includes IV, gavage and what’s known as subcutaneous fluid therapy, as these grebes are always dehydrated upon intake. If they improve, then the birds begin receiving nutrition and further treatment. An oiled Western Grebe, November 2012. Photo by Julie Skoglund. Other common afflictions affecting grebes include fishing tackle injury or oiling, as seen last week on our blog involving a large, male Western Grebe (photo right). This is the time of the year when we receive oiled grebes from the natural oil seeps that occur along our coast. International Bird Rescue bands all of its rehabilitated grebes upon release. For more detailed information on our efforts with these species, click here. We depend on your support to help care for these animals. Please consider becoming a supporter for the care and treatment of a grebe or another aquatic bird through our Adopt-a-Bird program. Your donation can be in honor of a friend who loves birds or in memory of a loved one. There are many ways to give! In last week’s clue for our current Blue-Banded Pelican Sighting Contest, we talked about pelicans that hang out at fish-processing stations, fishing docks and other local spots. Other good places to see banded pelicans are breakwaters. These are actually roosting areas — safe from predators and people, a place where pelicans and other birds can sleep and just hang out. Getting to them is not always easy, of course — sometimes it takes a boat to do so. Last February, we had a friend take us out to the long breakwaters that protect the Los Angeles Harbor. There, we saw about 2,000 pelicans in a single morning, and counted nine blue-banded birds and about eight others that were federally banded (metal bands), but we could not read those bands due to the rocking of the boat. The metal-banded birds were likely International Bird Rescue’s rehabbed birds. One of the frustrations in spotting Blue-Banded Pelicans is that sometimes the birds are lying down and you cannot see their legs. It’s illegal to disturb them — and we never would — but there may be more banded birds out there than we thought. If you have the time, patience pays off: While we were watching some potential banded pelicans move about, we spotted a Brown Booby — a rare and exciting sighting. Some breakwaters are close enough to shore where you can actually get a good view of banded birds. For example, the photo below of C84 was taken earlier this week in Monterey, Calif. C84 came to our LA center on 1/21/10, and was an adult bird that was thin and weak, basically starving for unknown reasons. We had a bunch of adults that year that were starving adults, and most had to be washed due to a mysterious substance on their feathers that we never did identify. C84 was released in San Pedro on 1/29/10 and was just sighted on 11/12/12. Good luck! Over 30 banded pelicans have been encountered and reported in the last two weeks! Blue-Banded Pelican C84, photo by Deanna Barth.